Welcome to the exhibition devoted to the memory of prominent Russian journalist Anna Politkovskaya. In her articles Anna exposed corrupt politicians, war criminals, sharply criticized the government. She was also a distinguished human rights advocate. Her murder at the hands of professional killer is another example of similar occurrences in modern Russia. There have been other journalists in Russia who wrote the truth, but her voice sounded louder than anybody else's," Grigory Yavlinsky, leader of the Yabloko party, told RFE/RL's Russian Service. In the end, Politkovskaya was killed because of her refusal to soften her criticism of the Kremlin, he believes. "She was not simply a political journalist; she was a political opponent of the authorities. In this case it is evident that they have destroyed a political opponent. The authorities have begun eliminating their political opponents physically." The exhibition will be open in full after December 10th. The new entries are coming untill this date. The exhibition was opened on December 10th 2006 on this site. 125 artists from 41 countries sent totally 403 works. 75 were selected for our virtual gallery. We are also glad to inform you that this spring we opened our exposition in Hannover, Germany, and in Moscow, Russia. The exhibition in Hannover took place in city's main church Marktkirche from May 9th till June 3rd. Please click here to see photos from Hannover. The Moscow's exhibition was a part of the 26th WORLD CONGRESS OF THE INTERNATIONAL FEDERATION OF JOURNALISTS. More than one thousand journalists from around the world gathered in Moscow to discuss their problems. The 26th IFJ Congress took place from May 28 to June 2. Please click here to see photos from the IFJ Congress. 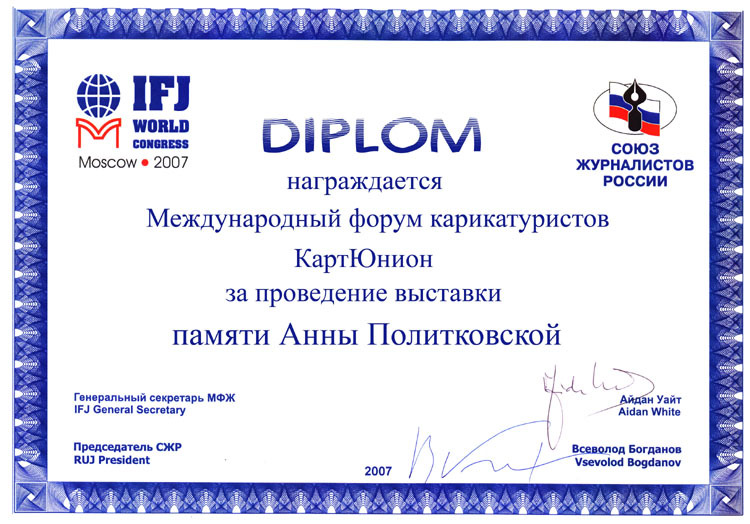 CARTUNION is proud to announce that our Forum was awarded with the Honorary Diploma for our initiative in Memory of Anna Politkovskaya.